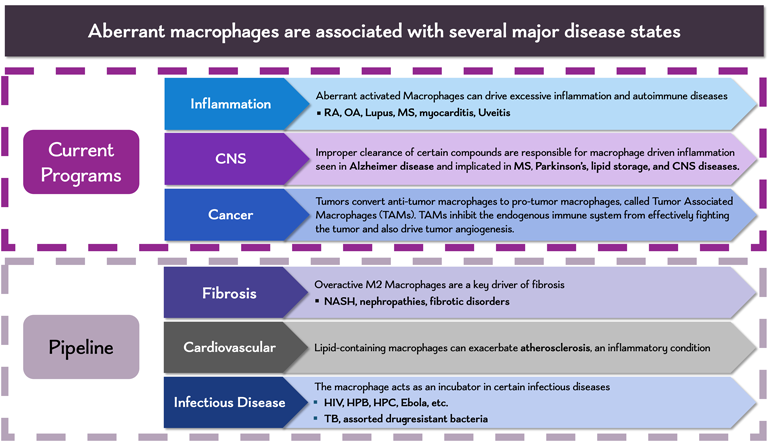 Therapeutic Areas of Focus :: Macrophage Therapeutics, Inc.
Macrophage Therapeutics has active programs in Anti-Inflammatory, CNS, and Oncology applications. MT has also identified other indications where aberrant Macrophages play a critical role. 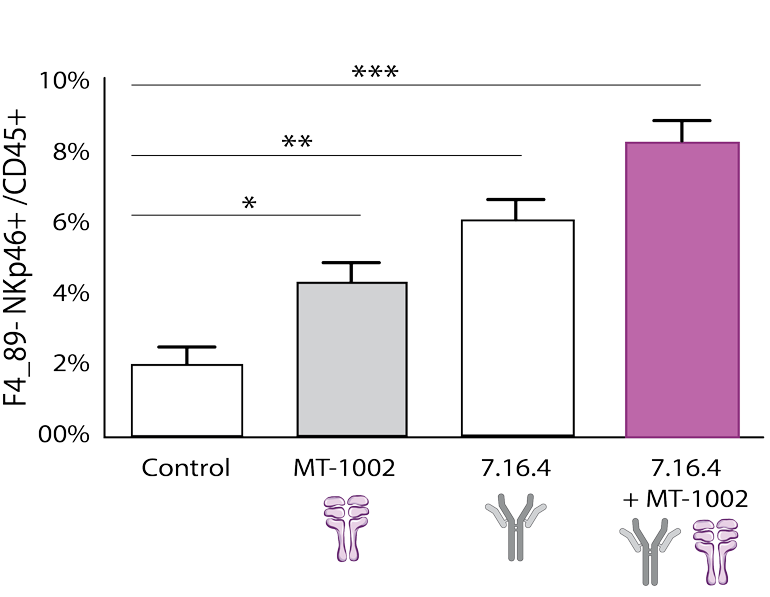 MT has developed a novel targeted steroid (MT-2000 class) which uniquely targets and modulates ONLY the disease-causing pro-inflammatory macrophages (M1 Macrophages) to healing macrophages (M2 Macrophages). 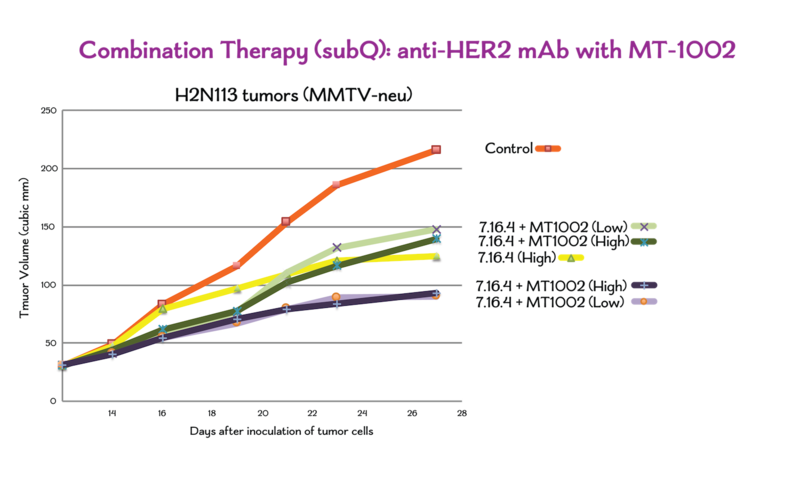 MT is delivering clinically proven glucocorticoid with increased safety and efficacy. Studies and clinical practice have demonstrated there is no safe dose of steroids due to the exposure of non-disease-causing cells to these powerful agents. 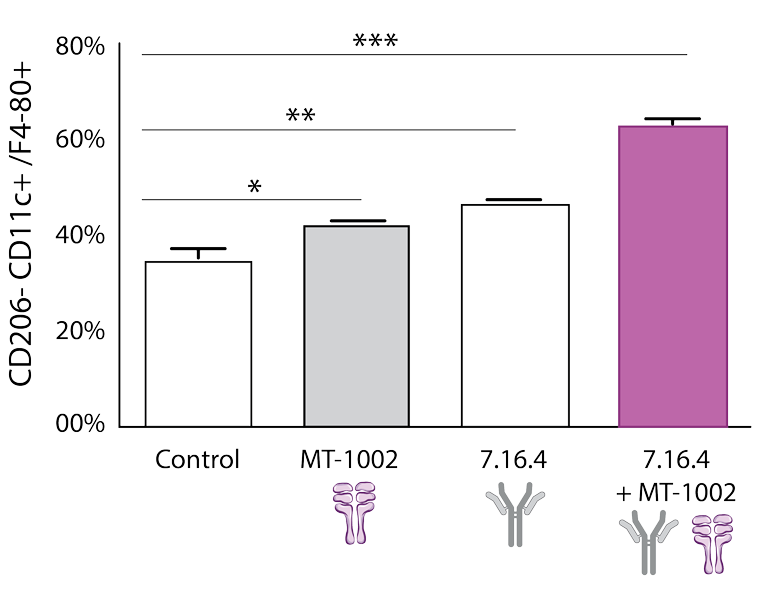 However, through MT’s proprietary receptor-mediated delivery platform we can deliver the world’s most potent anti-inflammatory agents to ONLY the activated disease-causing M1 macrophages. 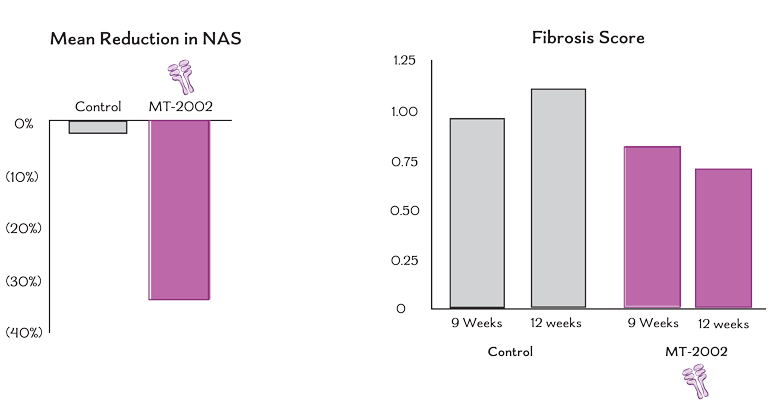 This approach eliminates off-target exposure to the steroid agent and therefore eliminates the side effects associated with traditional steroid therapy approaches. The macrophage is the main actor in the innate immune system, which is the ultimate driver of the adaptive immune system (T cells and B cells). The pharmaceutical industry has developed many therapeutics that target specific pro-inflammatory proteins, chemokines, cytokines, and proteases which are primarily released by or triggered by activated M1 Macrophages including TNF-alpha, IL-6, and the JAK's. Because of the great redundancy among the activities of cytokines, we believe that selective cytokine blockers and other approaches that target individual immune-active proteins will only be moderately effective in most patients. 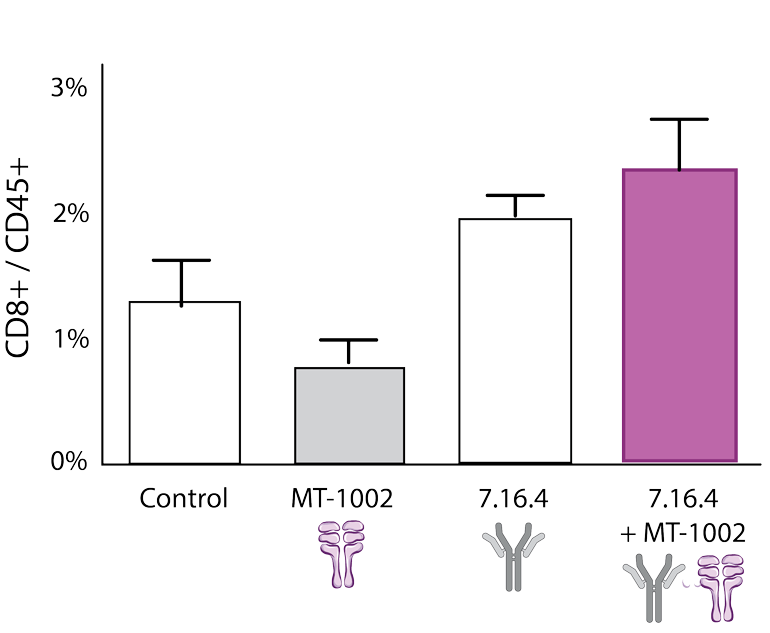 MT’s approach uniquely targets the disease-causing macrophages and thus this approach takes into account all the products produced by the targeted macrophages. 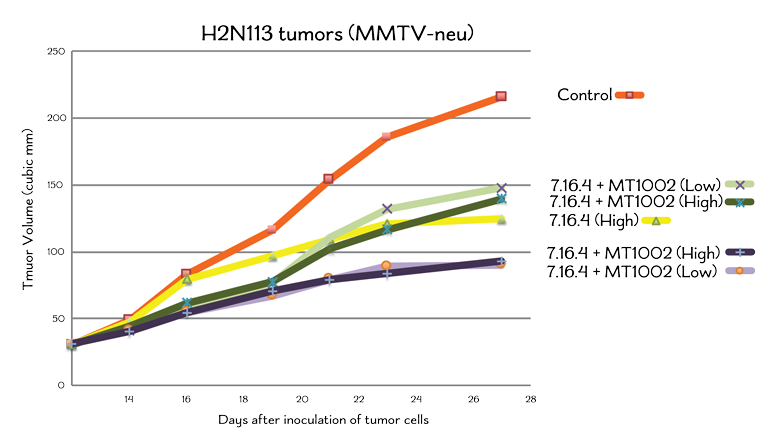 In addition, this approach enables easier dose selection and reduced risk of resistance. 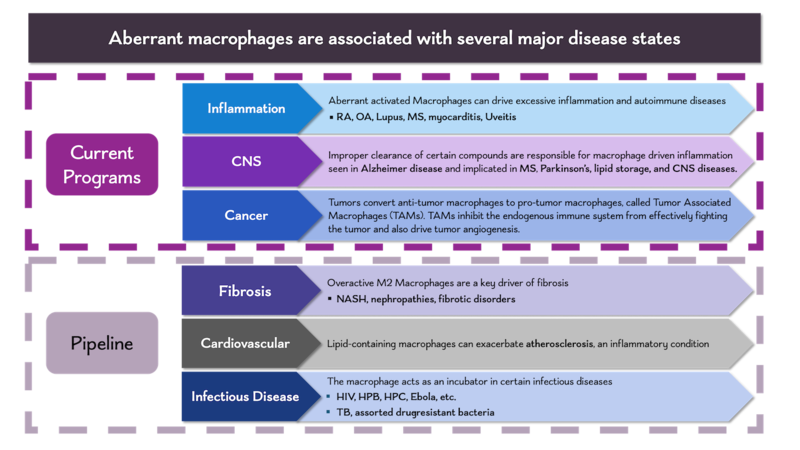 The vast majority of the macrophages in the body are non-active, even in macrophage-driven diseases, so targeting only the active state is critical to treating disease without compromising immunity. 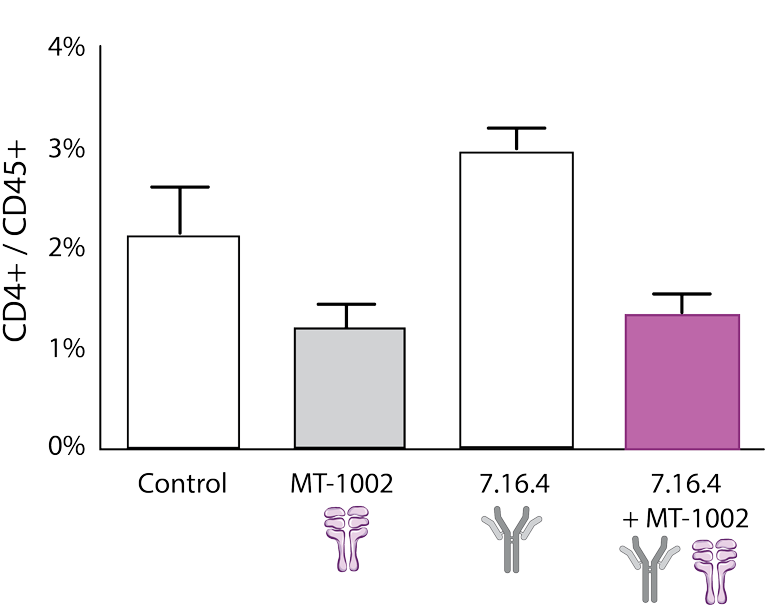 MT has demonstrated in animals models the ability to simultaneously decrease four pro-inflammatory markers that are secreted by disease-causing macrophages, successfully demonstrating an anti-inflammatory effect. 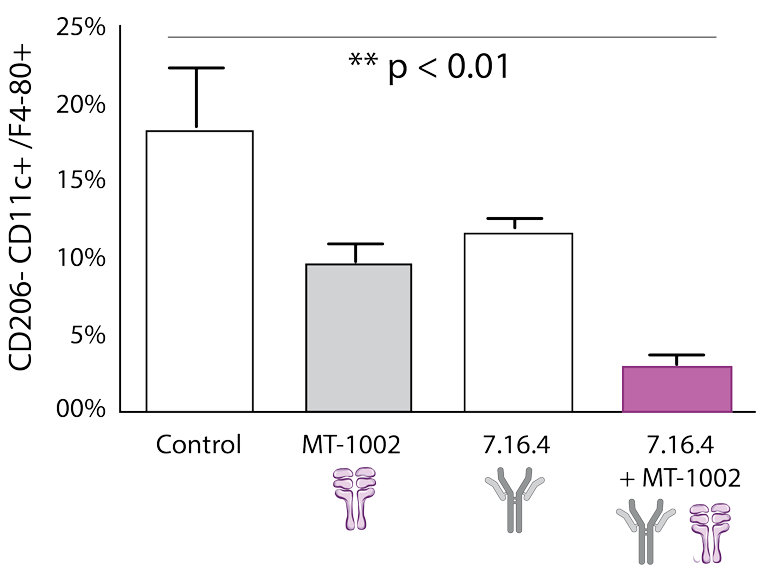 Macrophage Therapeutics (MT) has developed a product designed to deplete activated macrophages (MT-1000 class). 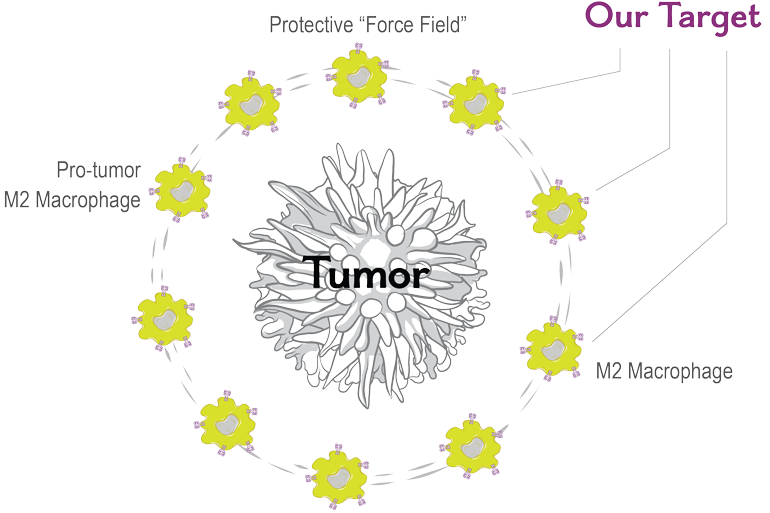 Tumor-associated macrophages (TAM’s) are critical components of the tumor microenvironment (TME) and play a substantial role in supporting tumor growth, metastasis and protecting the tumor from endogenous immune activity and exogenous anti-tumor agents (chemo, radiation, CarT, checkpoint regulators etc.). MT has generated data in animal models that demonstrate the benefits of its high-affinity targeting of TAM’s, specifically the ability to remove the TAM’s while NOT interfering with the endogenous immune system’s ability to fully target the tumor. MT’s product does not act on the tumor directly. Its activity results from conditioning the TME to enable endogenous immune cells and tumor-specific agents better access to the tumor. MT plans to license the TAM depleting agents and partner with companies developing anti-cancer products.